Larry the Wonderpup the new drama/animation television series, will air on the Seven Network later this year. Sherazade: The Untold Stories is based on the classic Arabian Nights tales. This contemporary animated series embarks on a whole new epic adventure! The New Adventures of Figaro Pho has been nominated for an AACTA award for Best Children’s Television Series for the second season in a row. The New Adventures of Figaro Pho follows a warm-hearted, adorable, quirky and mischievous character … who just happens to be afflicted with every phobia imaginable. Independent production company Chocolate Liberation Front (CLF), Germany’s Hahn Films and Toonz Entertainment in India are co-producing a brand newCGI animation series for 9-12 year olds, Sherazade: The Untold Stories (26 x 24min). Sherazade: The Untold Storiesis produced for Network Ten (Australia), ARD represented by RBB (Germany) and is being distributed by Telepool/Global Screen. The first thirteen episodes will launch in early 2016. Chocolate Liberation Front teams up with Hahn Films and Toonz animation on the Network Ten production of Sherazade: The Untold Stories. Oscura Second Shadow is now available for Android device owners via Google Play and Amazon. The New Adventures of Figaro Pho is now in production. Figaro Pho - Fear Factor wins at 2014 iKids Award at Kidscreen. Chocolate Liberation Front are incredibly excited to announce that the Kim Jong-il’s Cinema Experience website has now launched. The Adventures of Figaro Pho continues to charm and delight people all over the world, as evidenced by picking up not one – but two awards at this year’s Asian Television Awards in Singapore. 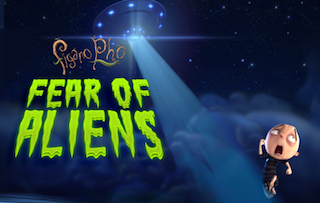 Figaro Pho Has A Fear Of Aliens This Halloween! The latest fearsome Figaro Pho game has been released - just in time for Halloween! Join Figaro on another fantastic adventure as he bolsters his courage to battle his Fear of Aliens. Available for download right now for both smartphone and tablet via iTunes or via Google Play for only $0.99! Conducted by the Australia Writer’s Guild, the AWGIE Awards recognise excellence in screen, television, stage and radio writing and we were proud to be win the award in the Animation category for the episode Fear of Unfamiliar Toilets. On 21st August in Sydney, the Chocolate Liberation Front were proud to collect the TV Series Gold Award for The Adventures of Figaro Pho at the 2013 Australian Effects and Animation Festival. Convenient Education, our interactive documentary about the experiences and challenges faced by international students, has its first television screening on SBS 2! Tune in on Tuesday 6 August at 9.35pm, SBS2. We’re proud to say that the wonderful Oscura has been nominated for a Webby Award! Chocolate Liberation Front are thrilled with the news that two productions - The Adventures of Figaro Pho and Wild Kratts Interactive, were winners at last night’s Kidscreen Awards in New York! Figaro Pho Wins an AACTA Award! The Adventures of Figaro Pho has won the AACTA Award for Best Children’s Television Series! Congratulations to Luke Jurevicius and the entire team! Titanic nominated for a Canadian Screen Award! Titanic - The Ultimate Immersive Experience is nominated as Best Cross-Platform Project at the Canadian Screen Awards. 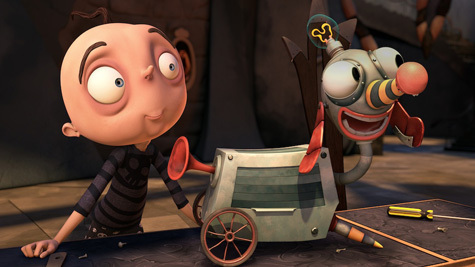 The Adventures of FIgaro Pho is nominated as Best Children’s Series at the AACTA Awards (AFIs). Congrats to Luke Jurevicius and the whole team. CLF is pleased to announce that Wild Kratts Interactive has been nominated for a Kidscreen Award! CLF are excited to announce that The Adventures of Figaro Pho has been nominated for an Australian Screen Sound Guild Award in the Best Sound for an Animated Short Film or Program category. It’s a big week for our little guy, Figaro. The first episode of the new long form series airs this Saturday night on ABC3! CLF hearts lots of things. Asimo the Robot. Snickerdoodle biscuits. Swim-up bars. Chocolate Liberation Front is Moving! As of Monday 13 August, Chocolate Liberation Front will be located at 326 Victoria Street Richmond. CLF is pleased to welcome two new operatives to the team: Lindsay Lipson and Katy Morrison. CLF is also pleased to announce that Amy Alexander has secured the role of Digital Media Intern specialising in animation and design. CLF are currently in production on ‘Wonderland’ (working title); an online interactive documentary by first time directors David Elliot-Jones, Lachlan McLeod and Louis Dai. ‘Wonderland’ is an investigation into the Indian Student Crisis; a world where thousands of vulnerable young people have been left to face exploitation, poverty and racial violence in the very country they were told would provide their dream future. CLF is proud to announce that after a marathon series of Cup Fever! during the 2010 World Cup Santo, Sam and Ed are back with Sports Fever! Produced by Working Dog, Santo Sam and Ed’s Sports Fever! is broadcast live in front of a studio audience and airs this Monday 30th of Jan at 10.45pm on Channel Seven. CLF is thrilled to be developing and implementing a social media experience for Sports Fever! overseeing all online activities of Twitter, Facebook and YouTube. CLF is very excited to share the news that Wild Kratts Interactive has been nominated for the Digi Awards in two categories! The Digi awards (formerly the Canadian New Media Awards) recognize the most exciting and well executed Canadian contributions to the global mediascape. We here at CLF are very excited by the release of the iOS app Oscura - the brainchild of designer/animator/art director/visionary Ole Alfheim, who with the other members of the CLF team and the wonderful people at MTV worked on this game that has a focus on beautiful visuals, seamless animation and ultra-fun gameplay. Media Peace Awards 2011 for their project ‘Asylum: Exit Australia”. The Media Peace Awards promote understanding and awareness about humanitarian and social justice issues by recognising those in the Australian media whose work stimulates public awareness and influences policy change. The project, Asylum : Exit Australia, is an immersive, interactive simulation that is based on the experiences of real asylum seekers, drawing on statistics and facts about the difficult journeys undertaken by refugees. Wild Kratts games go global! CLF would like to announce the expansion the of Wild Kratts digital property into 3 new languages! Thanks to the sales team at 9 Story, select packages of the wildly popular online games developed by CLF have been licensed to Discovery Kids Latin America and VRT (Belgium) and translated into Spanish, Portuguese and Flemish languages. The games, star Martin and Chris Kratt, and teach kids about the earth’s wildlife by introducing them to amazing creature powers, launched on PBSkids.com (US) and TVO.com(Canada) in December (2011) to tremendous popularity and acclaim. This marks the first of CLF’s digital projects to be translated, and we couldn’t be more excited! Wild Kratts Interactive was produced by Chocolate Liberation Front for The Kratt Brothers, 9Story , TVOntario and PBS with funding from The Bell New Media Fund and The OMDC. Dan and Frank will be traveling to Mipcom with a fantastic slate of new properties for television, online, mobile game platforms and an impressive collection of ganache chocolates. Chocolate Liberation Front is very pleased to have been shortlisted as a Finalist for a New South Wales Premier’s History Award for "Immigration Nation:Building Multicultural Australia Interactive Documentary" . The winners of the Awards will be announced by the Premier of NSW on September 5th as part of NSW History Week. We’ve purchased a block of 90% pure dark chocolate in anticipation. The Adventures of Figaro is going to be fantastic! As we are working on the TV series The Adventures of Figaro Pho, based on the award winning shorts for ABC TV, we are getting more and more excited! The scripts are hilarious and the artwork coming from the amazing Deane Taylor and the super talented team at Vishus Productions (creator Luke Jurevicius’ studio) is gorgeous. And with the animation team headed up by animation director David Webster we just know it will come to life like a dream. Exciting times ahead! An ambitious documentary series, Go Back To Where You Came From brings the often contentious subject of asylum seekers into the nation’s lounge rooms, bringing to the screen a confronting 25-day journey tracing in reverse the journeys that real refugees have taken to reach Australia. The Chocolate Liberation Front were proud to deliver the groundbreaking simulation Asylum: Exit Australia to SBS to accompany this latest offering. Asylum: Exit Australia goes live! Chocolate Liberation Front delivers the groundbreaking Asylum: Exit Australia online simulation for SBS. This simulation puts the user in the shoes of an asylum seeker exposing them to the difficult situations and decisions that are faced by people who are forced to flee their home country. Along the way the user will face danger and injustice, corruption and bureaucracy, but also find opportunities for kinship and cooperation. Their goal - to find a safe place for themselves and their family - is not an easy one. Asylum: Exit Australia was produced in association with The Australian Refugee Council, and with the support and assistance of Screen Australia’s National Documentary Program, Screen Australia’s Innovation Fund, Film Victoria and SBS Online. We've been selected as an Official Honoree at the Webby Awards! Chocolate Liberation Front has been selected as an Official Honoree at the 15th Annual Webby Awards for Immigration Nation: Building Multicultural Australia. The Webbys are the most prestigious international awards honouring excellence on the Internet, and CLF is very excited to sit alongside fellow Honorees Reuters, Associated Press, The Washington Post, Time Inc. and Media Storm. Chocolate Liberation Front will be attending Kidscreen in New York, February 15-20th, 2011. 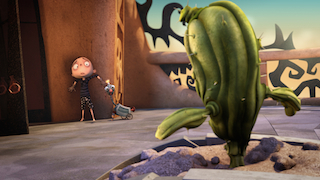 We invite buyer and broadcasters to view the brand new stop motion trailer for Critter Litter and the 2D/3D trailer for Oscura in the screening library. CLF will be promoting the The Adventures of Figaro Pho 13 x 30 mins (39 x 7 mins) series and will showcase the interactive service work completed from The Wild Kratts, Cup Fever, and Kids In The Hall Death Comes to Town all completed in 2010. Isn’t your own website the last thing you ever keep up? The CLF new look website provides quick access to the television programs, websites and video games we are working on at CLF. The new site is ipad and iphone compatible and there is a password protected client registration section. Innovative SBS Documentary launches at the Immigration Museum in Melbourne. The cutting edge documentary offers a three hour immersive experience that allows users to explore how migrants have build the nation of Australia. The online documentary will be available free of charge at sbs.com.au as will the streaming of the related three part documentary series Immigration Nation.